Saluki A.D. Jerry Kill (right) presents Bryan Mullins with a Saluki jersey on March 21,2019. 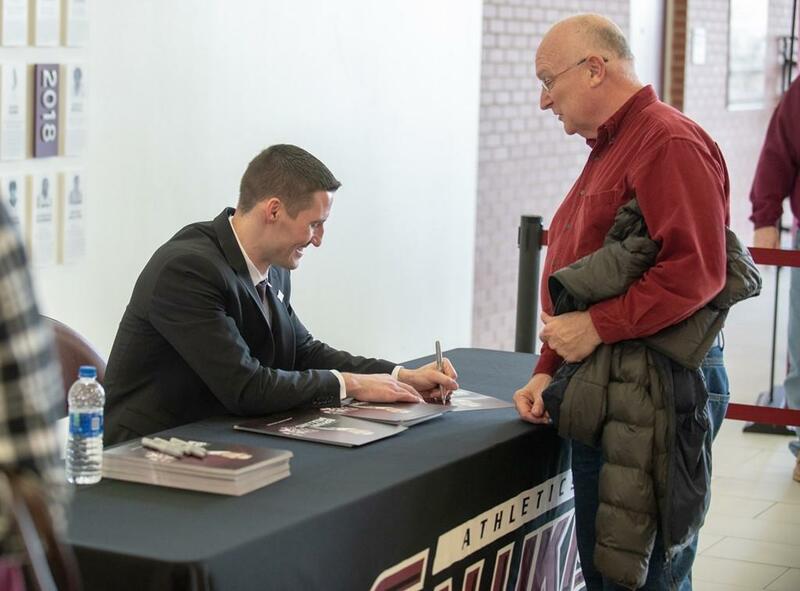 Hundreds of Saluki basketball fans turned out Thursday evening to welcome back one of the program's most beloved players. . 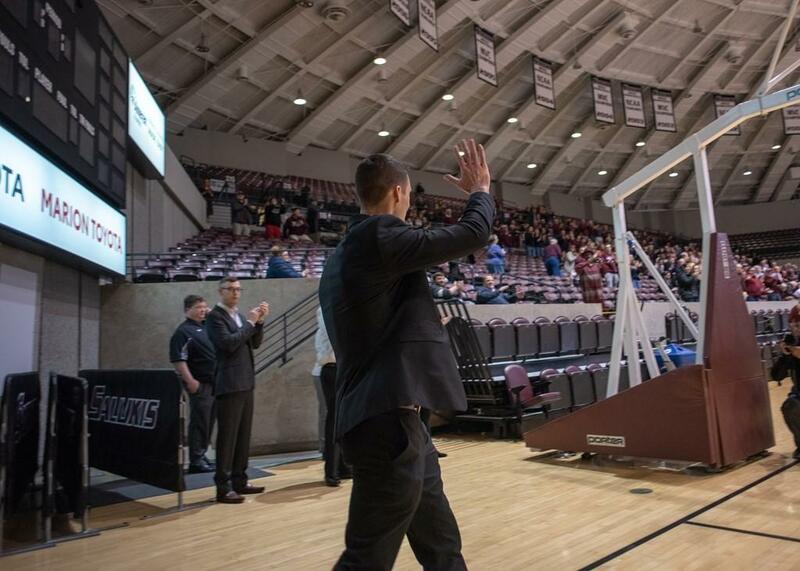 The Salukis rolled out the red carpet at the Arena for the new men's head basketball coach. During a pep rally and town hall meeting, Bryan Mullins answered fans questions and signed autographs. Mullins signs autographs for fans. At a news conference before the festivities, Athletic Director Jerry Kill said he succeeded in finding a coach who would be a good fit for SIU and the region. "Wanted to get somebody who was going to get our kids to play hard and there's no question he will do that. You can tell that the way he played...players reflect the coach." Another good fit is that Mullins has spent the past five years coaching in the Missouri Valley Conference at Loyola. Mullins said that's huge. "I know this team. I know the teams' rosters. I know what we need to make us successful. I know what types of players win championships in this league." The new leader of Saluki men's basketball is excited about his new job and the fans are excited about his hiring. Mullins is greeted by a thunderous ovation from fans at the pep rally. Mullins said he was unaware until around a week ago about how many fans wanted him to take over the program. When asked why fans love him, the Saluki Hall of Famer said he hopes it's because of his work ethic and toughness. "There's nothing magical. There's nothing crazy about me. I believe in working hard and doing your best. I believe in relationships with the guys. I got to be able to pull the most out of every single player." Mullins is just 32-years-old, but he wants fans to know he's ready to be a head coach after five years on the staff at Loyola. "I've prepared for this, really since the day I started coaching, especially at Southern Illinois too, a school where I played at and where I know you can be successful." Mullins said he is currently working on hiring assistant coaches. He has reached out to the Salukis' returning players and incoming recruits and said none of them indicated they want out of their commitment. Mullins said he was offered the job Sunday night and signed his five year contract worth $475,000 per year on Wednesday. SIU welcomed home one of its all-time greats Wednesday, naming Bryan Mullins as the school's 14th men's basketball head coach. The 32-year-old signed a five-year contract with the school at $475,000 per year.